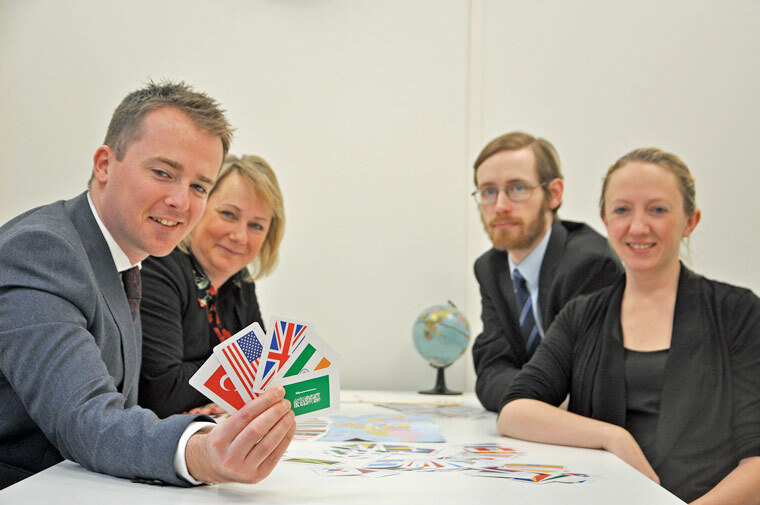 Flying the flag- Rob Booth, head of DCCI’s International Trade Department, holds up cards flagging up some of Dorset main export markets, including India, Saudi Arabia, Turkey and the USA. Behind him is administrator Amanda Johnson. Back right is documentation assistant Colin Dyke and finance assistant Rebecca Rogers is front right. New figures out show Dorset Chamber of Commerce and Industry (DCCI) helped the county’s firms export £163.5M worth of goods in 2016. DCCI’s International Trade Department processed some 11,133 transaction documents during the calendar year for firms selling abroad. The chamber, the county’s business support organisation, continues to expand its International Trade Department with two new members of staff in 2016. Two more – an administrator and a co-ordinator – are being recruited. Chief executive Ian Girling said, “Confidence amongst businesses in Dorset, including exporters, has rallied. Dorset firms supply an incredible array of products and services both to Europe and the wider world, helping to drive the local and national economy. The top destination for exports from Dorset in 2016 was Saudi Arabia with 2,082 documents processed; followed by UAE with 1,551; Qatar with 869; Turkey with 762 and Kuwait with 615. In terms of shipment values the highest destination totals were UAE with £38.6m, Turkey with £20.9m, South Korea with £16.4m, Egypt with £11.5m and Saudi Arabia with £8.5m. Non-EU trade accounts for some 95% of DCCI’s International Trade Department work. This is due to the nature of the European customs union which allows goods to move freely across the 28 member states with minimal paperwork. Rob Booth, head of DCCI’s International Trade Department, said any impact of Brexit would depend on how quickly new trade agreements were signed. He added, “Experienced and new exporters are encouraged to get in touch to discuss how we can best help them. “We provide a comprehensive range of expert support, training and advice to help businesses navigate the export trade journey in as easily and efficiently a way as possible. For more details, contact the International Trade Department on 01202 714800, email export@dcci.co.uk or visit www.dcci.co.uk/international-trade-training.